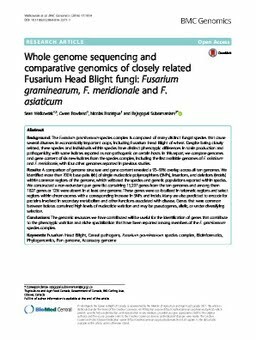 Background: The Fusarium graminearum species complex is composed of many distinct fungal species that cause several diseases in economically important crops, including Fusarium Head Blight of wheat. Despite being closely related, these species and individuals within species have distinct phenotypic differences in toxin production and pathogenicity, with some isolates reported as non-pathogenic on certain hosts. In this report, we compare genomes and gene content of six new isolates from the species complex, including the first available genomes of F. asiaticum and F. meridionale, with four other genomes reported in previous studies. Results: A comparison of genome structure and gene content revealed a 93-99% overlap across all ten genomes. We identified more than 700 k base pairs (kb) of single nucleotide polymorphisms (SNPs), insertions, and deletions (indels) within common regions of the genome, which validated the species and genetic populations reported within species. We constructed a non-redundant pan gene list containing 15,297 genes from the ten genomes and among them 1827 genes or 12% were absent in at least one genome. These genes were co-localized in telomeric regions and select regions within chromosomes with a corresponding increase in SNPs and indels. Many are also predicted to encode for proteins involved in secondary metabolism and other functions associated with disease. Genes that were common between isolates contained high levels of nucleotide variation and may be pseudogenes, allelic, or under diversifying selection. Conclusions: The genomic resources we have contributed will be useful for the identification of genes that contribute to the phenotypic variation and niche specialization that have been reported among members of the F. graminearum species complex.